A memoir by Thae Yong-ho, the former No. 2 man in the North Korean Embassy in London and now a vocal critic of the regime, has sold 50,000 copies in just 10 days. The book spills the beans on such aspects of the reclusive regime as Thae was able to witness, richly peppered with anecdote, hearsay and speculation. One interesting aspect is North Korea's fractious relationship with religion. Among the tidbits is that North Korea built a fake church and cathedral in Pyongyang in the 1980s in an attempt to show the outside world that religious freedom exists in the North. The pews were filled with diehard communists, but as time progressed, some actually began to convert to Christianity. North Koreans attend a worship service at a church in Pyongyong in this undated photo. The book also touches on a bizarre episode in 1991 when North Korea tried to invite the pope in an attempt to escape international isolation. When the Vatican asked North Korea to show evidence of any actual Catholics, the regime searched high and low and finally found an old lady who had been a Catholic before the 1950-53 Korean War. Terrified, the woman at first vehemently denied her faith, but later confessed that God has been with her and always would be and revealed a secret altar in her backyard. North Korean leader Kim Jong-il eventually dropped the idea. The Chosun Ilbo asked Thae what lies at the bottom of North Korea's fear of religion. "Unlike traditional communist countries, North Korea is unique," he said. "European countries clamped down on religion, but they did not destroy them. They even left places of worship unharmed. But North Korea destroyed all places of worship and blamed it on American bombers. Instead, it made people worship their leader. The constitution guarantees religious freedom, but the Workers Party's rules say the ideological teachings of Kim Il-sung and Kim Jong-il are the true guiding words." Some defectors say North Koreans can be converted to Christianity simply by swapping their deity from the dear leader to God. "Christian worship and North Korean political rallies are very similar. They start off by singing and listening to teachings. 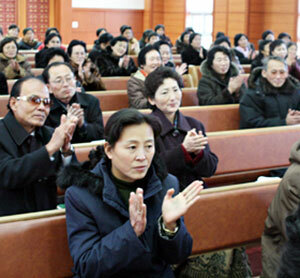 Worship involves sermons, and in the North people listen to the teachings of Kim Il-sung and Kim Jong-il. This is followed by a repentance session." Which religion does North Korea fear the most? "Christianity. Kim Il-sung came from a Christian family, so they know how the religion works. They know that Christianity would hamper the Kim family’s dynastic succession to power." Thae also offered advice about what South Korean religious communities should do ahead of a rise in cross-border exchanges. "Kim Jong-un will create economic stimulus zones that are isolated from the outside world. You must insist that North Korea builds churches for both South Koreans and foreigners. You must convince the North that allowing religious freedom will instill trust. Seeing churches with the crucifix will move North Koreans." Thae has faith in the role of South Korean churches in helping and caring for North Koreans. "I lectured in a church yesterday. South Korean Christians are very passionate about reunification, and Christian pastors are the ones who care for defectors."